At it's most basic, a healthy menta state is what gest us though the day. But for a creative's brain, a healthy mental state can mean the best of worst for your ability to produce meaningful work. Whether your greatest pieces are derived from a bleeding heart or a clear mind, striking the perfect balance is a struggle that one should not have to tackle alone. 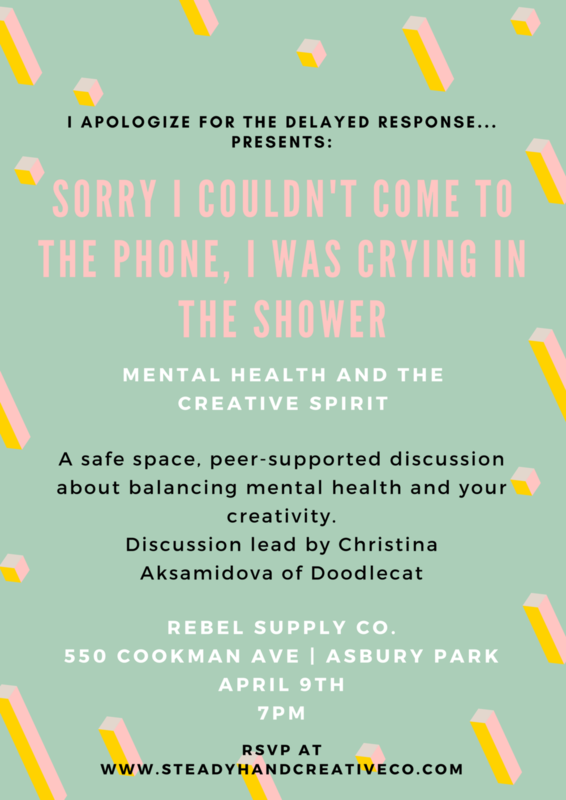 Join us on April 7th at Rebel Supply Co. where Christina Aksamidova of Doodlecat will talk more about her own journey to find balance and share tools that have helped her! We encourage participants to feel safe in sharing their own journey during this event but it is not obligatory in order to take part. This event is FREE to all who would like to join in, but we ask that you RSVP here.